I am asked this question over and over, by moms and others wanting to feed their children and their families nourishing whole grains. They are puzzled because it doesn’t say so on the box. Hmmmmmmmm. Another problem with eating processed food in the industrial agricultural model, another problem with a food system that is run by what I call the “Food Industrial Complex”. Somewhere along the way we got away from eating whole grains the way they are best eaten…soaked for a long time with what I call a “neutralizer”…and then served with good, wholesome butter from pastured cows, or their unadulterated (read fresh from the cow), full fat cream. Mmmmmmm mmmmm delicious! AND nutritious! I will be teaching all the WHYS, HOWS, WHATS and FOR HOW LONGS about whole grains AND legumes this Saturday, February 6, in Alexandria, VA. This information is in addition to what may be found in the Nourishing Traditions cookbook. To register, see the 2010 class schedule page. And if you can’t make it to class, you may pre-order a beautifully hand-illustrated BEAN and GRAIN chart. 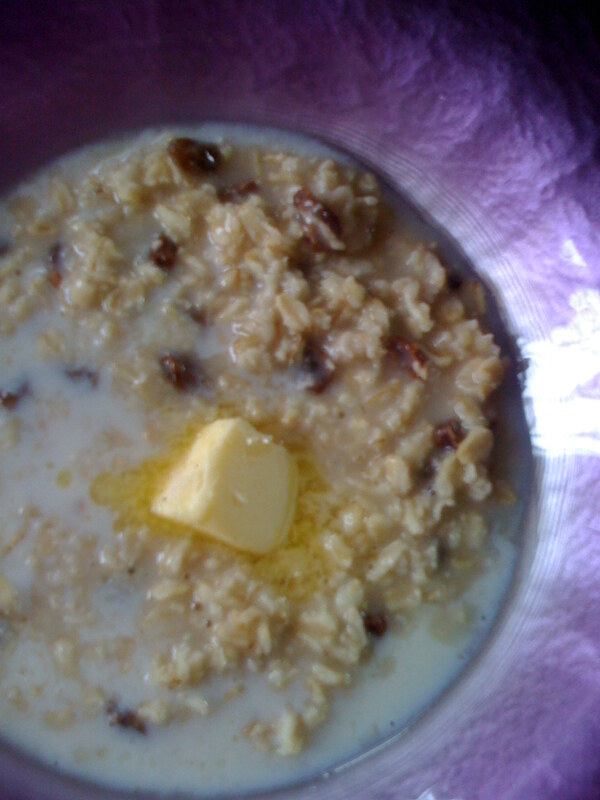 Delicious SOAKED oatmeal, with butter and milk from pastured cows. new classes added to 2010 schedule! Microwaved frozen dinners got you down? Feeling tired? Digestion sluggish? Want to feel nourished and satisfied after a meal? “Eating Right” may not be what you think…HOW FOOD IS PREPARED really counts. Learn simple, traditional techniques to make the nutrients in your food more available to your body, easy to digest, and deeply nourishing. Check out the 2010 class schedule. I just added a six class series of Cooking for Well-Being Cooking classes in Falls Church starting in February. These classes are based on the Nourishing Traditions cookbook. We will properly soak grains and beans, make nutritious and delicious stocks, and make sense of fats, cholesterol, proteins and carbohydrates… I will also be teaching a new series Gluten-Free Optimally: Balancing Kids with AD/HD and ASD Through Food in Clarksville, MD starting with an introductory talk at Great Sage on January 25. Looking forward to cooking with you in 2010!